Europe's ageing population is going to cause a sharp productivity slowdown and cause serious economic problems, according to new research from staff at the International Monetary Fund. Europe's already ageing population is about to swell as workers reach retirement age, which in turn will cause a substantial drop in productivity, IMF staff members Shekhar Aiyar, Christian Ebeke, and Xiaobo Shao, wrote . European productivity is already poor by historical standards, particularly in states like Italy and Greece, where rock-bottom productivity has previously caused significant economic issues. In fact in Italy, weak productivity growth is one of the biggest factors in the country's stagnant economy. Within the next two decades, the IMF argues, the number of people in the European workforce aged between 55-64 will increase by one third, growing from 15% to 20%. This in turn could cause big issues. "There are several different theories regarding age-related effects on productivity. On the one hand, accumulated years of work experience could make older workers more productive. On the other hand, frailer health and obsolete skills could reduce their productivity, at least beyond a certain threshold. While it is difficult to generalize across occupations, the consensus in the literature is that productivity increases with age at first, peaking sometime in the 40s or 50s. Then it diminishes." "First, ageing will take a considerable toll on productivity growth over the medium- to long-term. As shown in Chart 2, average total factor productivity growth in the euro area is forecast to be around 0.8 percent per year. This could be higher by a quarter—that is to say, total factor productivity could increase to about one percent per year—if we shut down the effect of workforce ageing. This result stands in stark contrast to the United States, where the workforce is not projected to age at all (in fact, it is projected to become slightly younger), and hence the impact on total factor productivity is negligible." 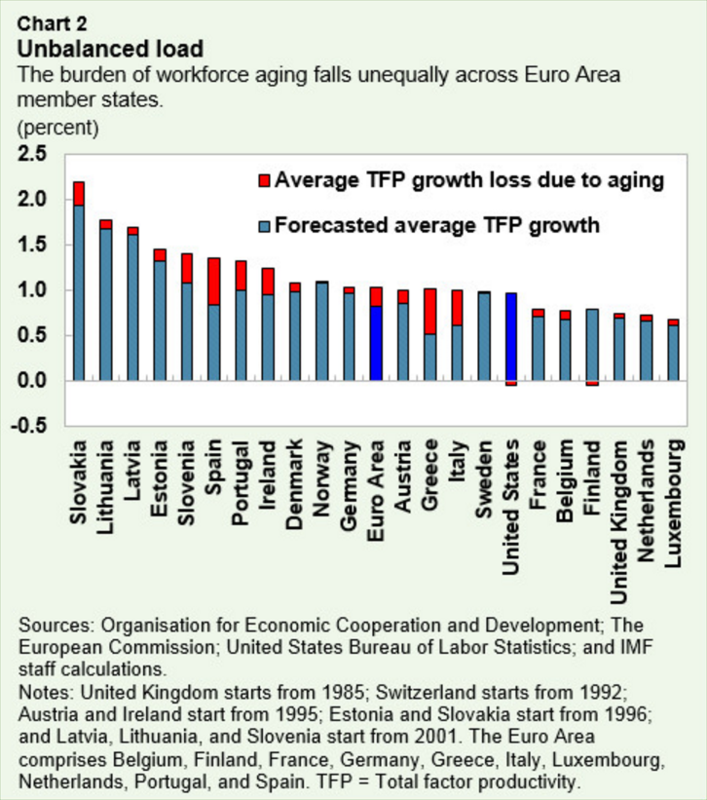 "Second, the burden of workforce ageing will fall unequally across euro area member states.Worryingly, some of the largest adverse effects on productivity will fall on countries that can least afford it, such as Greece, Spain, Portugal, and Italy.These countries already have elevated debt levels and meager fiscal space, and need rapid productivity growth to build competitiveness and bring down unemployment." Europe's economy isn't exactly in a brilliant state as it stands. Years of negative interest rates and super-accommodative monetary policy have as yet at least, failed to stimulate the growth and inflation so desperately needs coming out of the eurozone crisis. Add into the mix the economic uncertainty caused by the UK's Brexit vote, and the last thing the continent needs is for productivity to fall even lower.